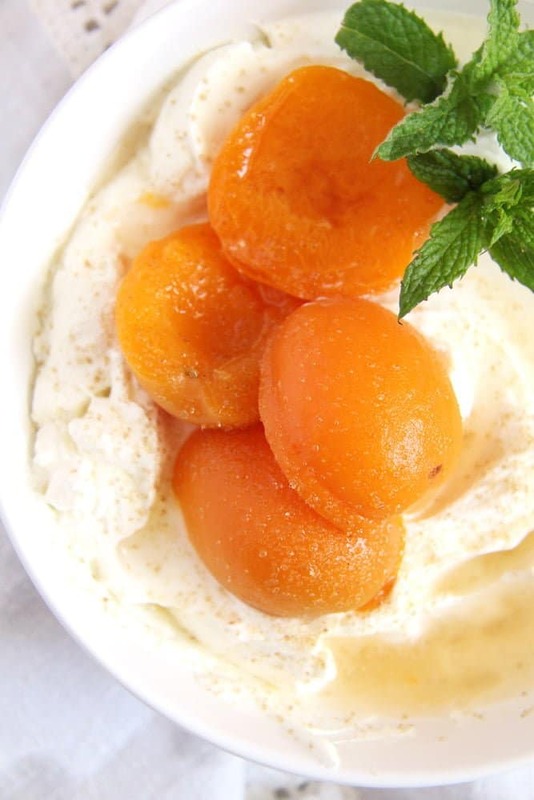 This is the easiest, most straightforward way of preserving apricots. Not to mention it is very low-sugar. And not only apricots, I preserve the cherries and the gooseberries growing in my garden the same way. I love this method because it is so simple, it involves the minimum amount of work and time and on top of that it uses just a little sugar. No sugar bombs in a jar, just a hint of sweetness, giving you the freedom of using the preserves in any way you like later on, not worrying if maybe they are already too sweet or anything. The fruit softens slightly but keeps its shape and structure, the fruit remains almost as “al dente” as fresh. So all you have to do actually, is to clean and sterilize your jars, wash and stone the fruit and boil the jars for about 20 minutes. I find this method especially suitable during the time when there are lots and lots of fruits growing in my garden, so many that I barely have the time to do more laborious work. For instance, we have this huge cherry tree, which bestows us with extremely large amounts of cherries almost every year. It takes a lot of time and work just picking the ripe cherries off the tree and there are only so many fresh cherries you can eat or bake in a short period of time. I do freeze a few bags as well, but I find this method of preserving much better than having to work with defrosted fruit later on. So I preserve a lot of cherries, just as you can see in this post How to Preserve Cherries. And recently I thought about preserving apricots the same way as well. We do not have apricots fresh from the tree here in Germany, the climate is too cold for them, but apricots are really plentiful in Romania and this time of the year is their best time. So why not take advantage of it and preserve some of these wonderful fruit to have it during the rest of the year as well. It is really so easy and you can barely find any better in a supermarket. 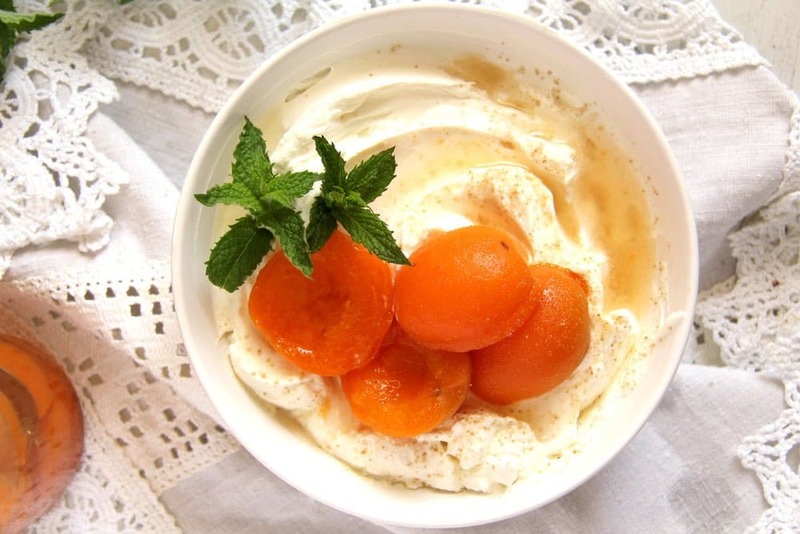 Canned apricots are to be found anywhere and I buy them often enough myself, especially for making cake fillings, but the homemade version is so much better. And healthier. The fruit retains most of its original taste and firmness, the added sweetness and calories are minimal. 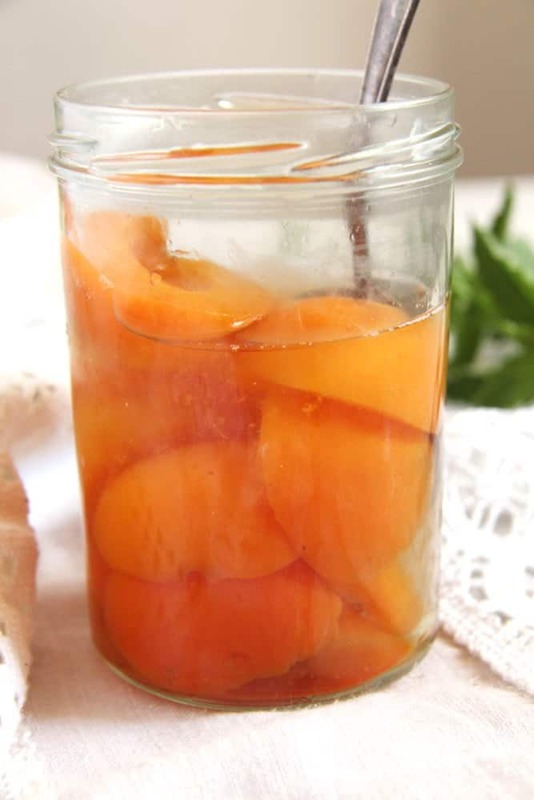 So, if you have an apricot tree in your garden (or your neighbor or friend does) and your pantry is already full of Simple Apricot Jam, do give these preserved apricots a try. You will probably be so impressed by the simplicity of this method, you will never try a more laborious or sugar laden one again. 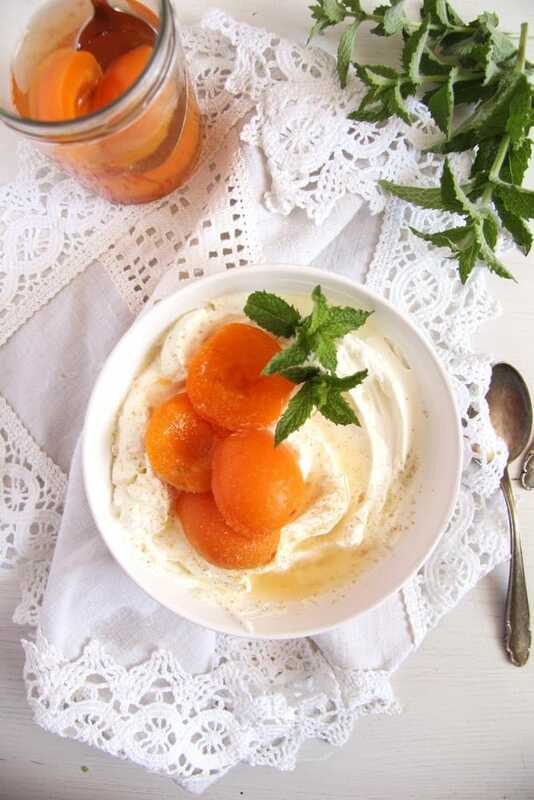 You could use the preserved apricots in any way you would use them when fresh, from eating them as they are to making cake fillings with them. You could make the Apricot Sauce from last week with these canned apricots, you could chop them into your porridge or müsli or you could serve them over strained yogurt like I did recently. To make the strained yogurt have a look at this post: Roasted Cherries with Strained Yogurt. Or another version of strained yogurt is to be found here: Yogurt Bomb with Berries. 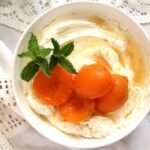 I will give you no quantities for this recipe for preserving apricots, there is really no need for that. You will only need fruit, as much as you have, enough jars to hold them, a bit of sugar and water. The only thing to remember is that you need 2 tablespoons sugar per jar. That’s it! To prepare the jars preheat the oven to 130 degrees Celsius/ 275 degrees Fahrenheit. Wash the jars and the lids very thoroughly. Place the jars on a baking tray and sterilize them in the oven for 20 minutes. Cook the lids in boiling water for a few minutes. Leave to cool slightly, the apricots and the water will be cold when added to the jars. In the meantime clean, halve and stone the apricots. Place them in the jars with the bulge facing up. Add two tablespoons sugar to each jar and fill with water. Put the lid on. Take a large pot, large enough to hold your jars without them touching each other. Place a clean, folded kitchen cloth on the bottom of the pot. Arrange the jars on top. Fill the pot with lukewarm water, about 2/3 of the jars should be immersed in water. Don't be tempted to fill the pot with hot water or the jars, which are filled with cold water, might shatter. Bring the water to a boil, then cook for 20 minutes. Take them out of the water immediately (Caution HOT) and place them on a baking tray for instance. Cover them tightly with a blanket or several thick kitchen cloths and leave them to cool slowly until the next day. They will keep in the cool cellar or pantry for at least 6 months. I still have cherries and gooseberries I have made last year and they are still good. If you would like to make the strained yogurt have a look at this post for Roasted Cherries with Strained Yogurt. 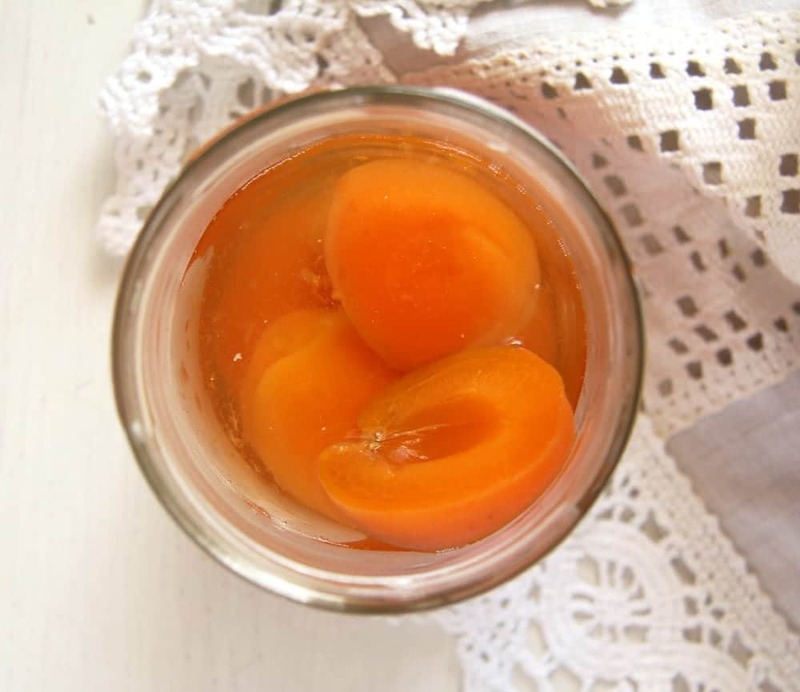 This is a great way to preserve apricots for the winter baking! I’ve never tried preserving but you make it seem so simple and the thought of almost-fresh “al dente” 🙂 apricots in winter is pretty enticing too. Your photos are just gorgeous, Adina! This is a wonderful and such an easy way to preserve fruit. Thanks for sharing Adina! Btw, I’m very jealous that you have a cherry tree in your backyard!!! That is awesome! I love canned peaches and always choose the low-sugar version. I don’t think I’ve ever tasted canned apricots, but I like them fresh, so I’m sure I’d like the canned version too. I always love the low-sugar versions of everything! Lucky you to have a garden and to have your own fruits! Great idea but you’ve neglected to mention at which point you put the kids on. Does a vacuum have to form ? That’s … Put the lids on…which Google keyboard insists twice to be kids. 🙂 🙂 🙂 I was confused about the kids for a second or two!!! It is written in the recipe that the lids come on the jars right after you have filled them. The vacuum forms while the jars are in the pot, in the boiling water.